Tell Ecover and Method: Synthetic Biology is Not "Natural"
As consumers, we trust that when a company calls itself natural and sustainable, its products won’t contain ingredients produced via genetic engineering or synthetic biology. Method’s parent company, Ecover, has just announced that it will be introducing a new ingredient, synthetic biology-derived algal oil, into its products. Method has indicated that it will follow the same route. This oil will be produced with new, virtually unregulated, unassessed experimental extreme genetic techniques. 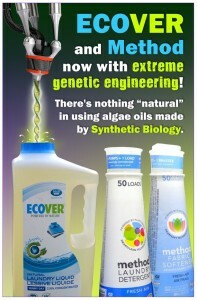 The synthetic biology-derived oil that Method and Ecover are supporting is far from ‘natural’. It is from highly novel bioengineered algae made in labs using synthetic DNA. Like many of the products of genetic engineering, it won’t be labeled or subject to health and environmental assessment and oversight. The commercial use of synthetic biology poses significant threats to the earth’s biodiversity, could speed rainforest destruction by increasing demand for sugar, and harm sustainable farmers and poor communities across the world whose cultures and income depend on farming truly natural commodities such as coconut oil. We call on Method and Ecover to listen to your customers and commit to not use unregulated, unlabeled synthetic biology-derived ingredients in any of your products. Please be true innovative leaders in sustainability and do not let your products become poster children for extreme genetic engineering. We call on Ecover to listen to your customers and commit to not use unregulated, unlabeled synthetic biology-derived ingredients in any of your products. Please be true innovative leaders in sustainability and do not let your products become poster children for extreme genetic engineering. Email info@syntheticisnotnatural.com to sign on as an organization.